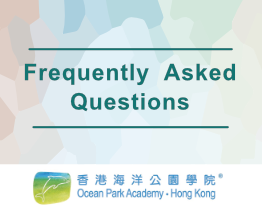 Ocean Park Academy Hong Kong (OPAHK) local school education programmes are available from Mondays to Saturdays, from 1 September 2018 to 31 August 2019. Outreach seminar is available from Mondays to Fridays, except public holidays. Applications for programmes from 1 September 2018 to 30 June 2019 begin at 12 noon on 13 August 2018. For programmes in July and August 2019, applications begin at 12 noon on 1 March 2019. To secure a booking, please submit your application at least 3 months in advance. All applications are considered on a first come first served basis. Application can be submitted online or by faxing the completed application form to 2518-8665 Please visit our website to make an online application or to download the forms. Applicants will be notified of their results within 7 working days of receipt of a completed application form. Please contact our staff at 3923-2323 (select the language and press ) if you do not receive any notification. ​​a. Credit Card: Please provide credit card details in the confirmation letter and fax the letter to OPAHK. b. Cash Transfer: Please deposit your fee in cash directly to The Hong Kong and Shanghai Banking Corporation (account no. 002-523165-001) and fax the pay-in-slip and confirmation letter to OPAHK. The original pay-in-slip must be shown on the day of the visit. If the payment cannot be settled within the aforementioned period, please contact our staff. We reserve the right to cancel the application. The "Teacher's Notice" will be sent to the school after payment. The receipt will be issued on the day of the visit. Tickets can only be used on the date of validation. They are non-refundable and no change of date will be allowed after confirmation. Schools need to choose one programme theme for each student. The programme is only available for schools classified under the school level of Education Bureau of the HKSAR as “kindergartens”, “primary schools” and “secondary schools”, but not available for schools classified as “others” by the same Bureau. Participants of Teacher Day Camp should be teaching staff of the schools classified under the school level of Education Bureau of the HKSAR as “kindergartens”, “primary schools” and “secondary schools”. All courses are conducted in Cantonese or English. Special requests for Putonghua should be made in advance on the application form. No food and beverages are to be taken into the Park. Baggage or bulky item over the size of 56cm x 36cm x 23cm is not allowed in any attraction or exhibit inside Ocean Park. You may deposit it at our Baggage Rental Counter (next to the Stroller and Wheelchair Rental in Aqua City, The Waterfront). All photos and videos taken at Ocean Park are not allowed for commercial use without prior approval from Ocean Park Corporation. 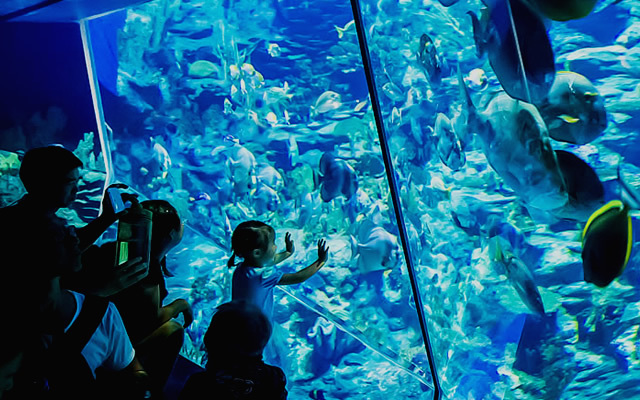 Admission to the Park signifies your permission and agreement for Ocean Park to take and use your photographs or images for educational and promotional purposes. Applicants are not allowed to advertise in the name of "Ocean Park Corporation" or "Ocean Park Academy" without prior approval from Ocean Park Corporation. Students might need to take the Ocean Express to the exhibits. The Education Bureau announces the suspension of schools. When the Hong Kong Observatory issues an Amber rainstorm warning, animal demonstrations are subject to change or cancellation. Programmes include Dolphin Tracking Trilogy, Sea Lion’s Got Talent, Insightful Journey with Dolphins, Coastal Explorers, Dolphin Snapshot and Workplace Visits to Ocean Park (Marine Mammal Training and Husbandry). A condition of entry is to comply with all the Park’s By-laws and safety rules which are available at the entrances of Ocean Park. Ocean Park shall be under no liability or responsibility for any loss of any kind or any damage to any property of any person in the Park. Please note that some of the Ocean Park facilities could be closed for renovation work. Programmes and dates are subject to change or cancellation due to animal and weather conditions. Animal demonstrations may be cancelled due to adverse weather. Programme content may be subject to change without prior notice. Ocean Park Academy Hong Kong (OPAHK) charitable organisations education programmes are available from Mondays to Saturdays, from 1 September 2018 to 31 August 2019. Application forms can be downloaded from our website and submitted by fax to 2518 8665. Applicants will be notified of their results within 14 working days of receipt of a completed application form. Please contact our staff at 3923 2323 (select the language and press ) if you do not receive any notification..
a. Credit Card: Please provide credit card details in the confirmation letter and fax the letter to OPAHK. The "Programme Notice" will be sent to the applicants after payment. The receipt will be issued on the day of the visit. The capacity for students in each programme is 15 – 30. Applicants need to choose 1 programme theme for each student. The programme is only available for charitable institutions and trusts of a public character which are exempt from tax under section 88 of the Inland Revenue Ordinance. The Education Bureau announces the suspension of schools or the Social Welfare Department announces the closure of all welfare service units of the department, all child care centres and centres providing after school care programmes. Programmes and dates are subject to change or cancellation due to animal and weather conditions. Programme content may be subject to change without prior notice.